Jump rope is not just one of the most affordable pieces of equipment; it’s also one of the most efficient training tools for boxers, and all other athletes, who want to improve footwork, endurance, quickness, explosiveness, coordination and more. Boxers are considered one of the toughest and fittest athletes in the field of professional sports. They are also those kind of athletes whose training regularly includes workouts, plus warms up and cool downs, with a jump rope. Skipping rope as part of the boxing training has been utilized by professional athletes for decades. 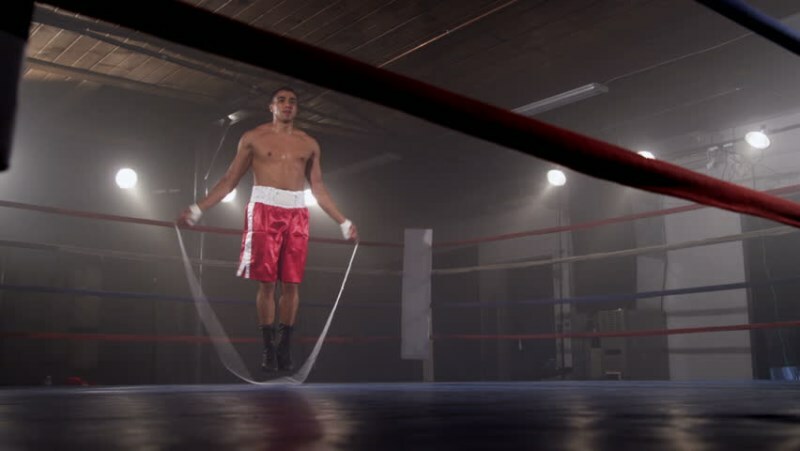 If you have ever seen a boxer working out with a jump rope, you have probably noticed how skilled they are and how lightly and efficiently they are skipping and moving across the gym, or a ring. We don’t over exaggerate when we say boxers are the masters of skipping rope. 7.1 Why do you think? What are some of the benefits of skipping rope for boxers? Boxers swap the traditional skipping for the so called boxer skip: this style mimics the footwork used during a fight. While jumping, they slightly shift their weight from one foot to another with each jump. Meaning, they don’t distribute the weight equally on two feet, but are constantly transferring the pressure from one to another. Besides mimicking the ring footwork, this technique allows them to preserve energy and last longer the boxers skip allows them to be more efficient. Compared to running, skipping rope also works the arms, wrists and shoulders, and out of all the cardio-vascular activities probably comes closest to mimicking boxing. Also, generally looking, the energy expenditure is higher for skipping rope (but of course there are several factors which determine that more specifically). That said skipping rope is a great way for boxers to building aerobic capacity and stamina. And we say stamina, we don’t just mean physical, but also mental component of it. Do you remember the level of mental toughness you needed to learn, and master, the double-unders? Well, exactly that. The benefits of skipping rope for boxers are way more than just improving athletes’ physical capacities. Learning the basics, the traditional skip, can be a hassle for some people. And once you master the basics, there are more advanced drills which for most boxers take years, along with big amounts of patience, to learn. Skipping rope teaches boxers to keep moving and stay focused (on the rhythm or the process) while the arms are burning, the legs are aching and the body is slowly giving up. Let’s take for example a traditional skip. To declare it successful, the legs and the arms have to work together and move in a rhythm that allows the arms swing the rope and the legs to jump over it – repeatedly. That’s one form of coordination. Some people simply don’t have it, other literally excel in it. World-class boxers are usually the masters of it. Coordination is needed in everyday life, in a boxing ring and at skipping rope. By definition, coordination is the ability to use different parts of the body together in a smooth and efficient way. Another benefit of skipping rope for boxers is making the fighter’s movement lighter, smoother and therefore more efficient. Jump rope also helps boxers develop lower leg explosiveness. Once you improve your skipping, from heavy and clumsy to light and smooth (for a longer period of time), your footwork and boxing performance will improve as well. If you move quickly while skipping rope, you will be faster in the ring. For boxers, body awareness and balance are crucial. It’s important they are aware of how their body is moving and (re)acting, especially in the ring with the opponent aiming directly at them. Body awareness and balance are also needed to perfect boxer’s skipping rope skills. Which means; improving jump rope drills will also improve athlete’s body awareness a sense of the body in a certain space, and balance. How you use a jump rope is all up to you and the goals you have set for yourself, and your boxing training. Speed ropes can be used for various styles of metabolic conditioning and interval training, focusing on high intensity rather than slow pace and longer time frame. Light-weight jump ropes are perfect for steady pace, endurance like workouts, perfect for building aerobic capacity and fighting endurance. Skipping rope is also a great way for boxers to warm up or cool down, before and after a fight or training session. Are boxers the toughest and the fittest athletes in the world of sport? Let us know by commenting below.